Google Home Services has recently been offered by Google for certain industries. Originally just for plumbers and locksmiths, it has expanded to include HVAC, electricians, garage door services, roadside assistance, auto glass installation, painting, handyman, home cleaning and appliance repair categories. Initially launched in San Francisco in 2015, it further expanded to Stockton, San Diego, Los Angeles, and most recently, in Philadelphia. What Is Google Home Services? You’ve likely heard of Google AdWords, a paid subscription whereby businesses pay for ads based on certain keywords and phrases for their product or services. It’s a great way to get listed at the top of search results, especially if your organic SEO campaign is in its beginning stages. Google Home Services, also known as Google Home Service Ads, are an alternative to Google AdWords for local service providers to appear in the top results if the business is a subscriber. 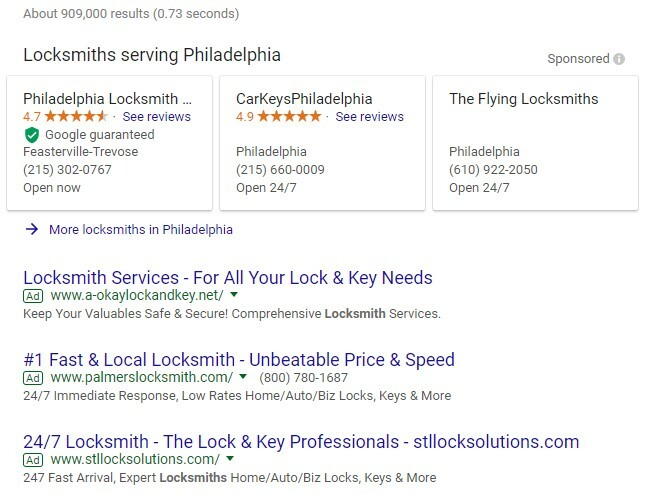 For example, entering a search phrase for “locksmiths in Philadelphia”, produces the following results. The three companies listed at the top feature the top three Google Home Services subscribers, appearing above the companies paying for AdWords, as well as the organic Google 3-pack. 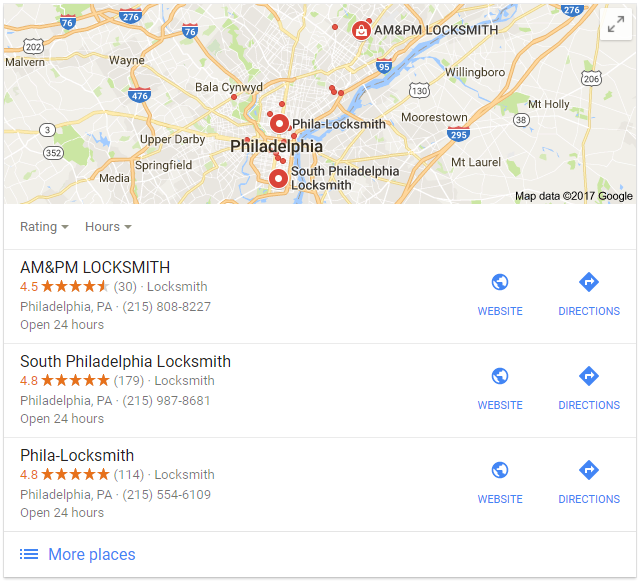 If you click the link “More locksmiths in Philadelphia” below the GHS list, you’ll get the complete list of GHS subscribers in Philadelphia. The order of GHS listings are determined by proximity to potential customers’ locations, the business review score on Google, the number of review scores received, responsiveness to consumer inquiries and requests, business hours, and whether or not Google receives serious or repeated complaints about the business. If someone clicks on a GHS listing, another page (below) will be displayed with additional information about the business. Potential customers can either call you or send you a message request by clicking on your ad. When they do, you’ll get an email and notification from the Home Service ads mobile app. From this point on, the lead is yours to turn into a customer. 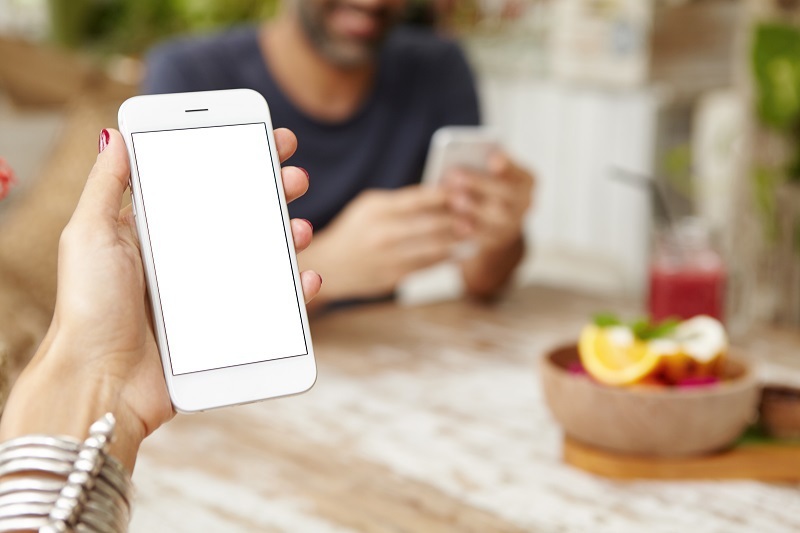 But be aware that if you fail to respond, Google will penalize you by either removing the option to click or removing you from the top results. 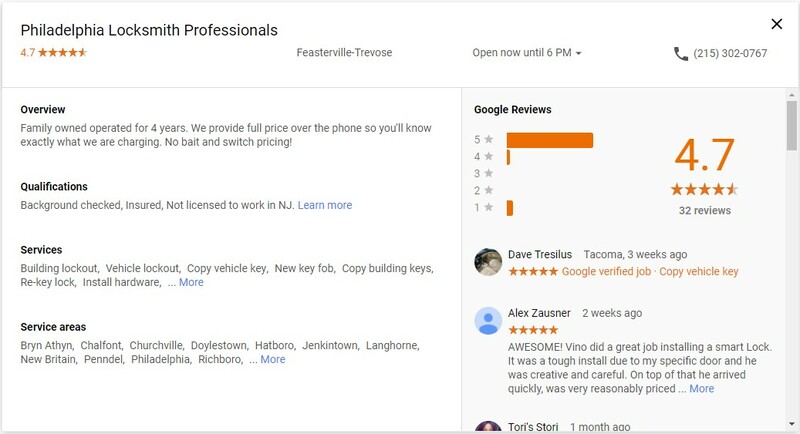 This is a huge opportunity for small business owners in the services industries as they can now focus on customer experience, given that the Google service will pull from the list based on customer reviews. If this initiative by Google scales, many service-based businesses like carpet-cleaning, roofing, painting and others may follow suit in the program. You get top billing in the local search results. It’s easy for customers to click on your ad when they’re searching for your service. Leads are from people who are really interested in your business and service; i.e., your target audience. The Google guarantee inspires trust in most people, enhancing your online reputation. You only pay for leads related to your business and the services you offer. Currently, Google Home Service Ads are not available yet in the St. Louis area. But with the success of the program on the West Coast, and the fact that it’s moving east, it’s a good bet that other cities will be included on their radar in the near future. So it’s advisable to stay up to date on this availability and apply as soon as it allows, since many businesses are on the waiting list in cities where it’s available. St. Louis SEO for Growth can help you create and implement a comprehensive SEO implementation process. Start by getting your free SEO audit report. Once you know where you stand, we can help you maximize your online presence.